Last week wasn't the best week. Probably one of the worst I've had for awhile. My emotions were on overdrive and it was a battle not to let them be in charge. I failed a time or two. I spent a good portion downcast and on the verge of tears...sometimes sad tears, sometimes stressed tears, sometimes angry tears. And the temptation to "prove myself" came on strong. These battles are not new to me. If you've read my blog or my column for awhile, you know I've struggled with depression. With God's help and His insistence on working through the pain, I now know what it's like to live outside the pit. Praise Him! But in moments of intense stress and emotion, it's still easy for me to slip back in. We all have areas like that. So I'm not going to berate myself (which is also a temptation of mine) for slipping. God sees me through Jesus. He sees me as a treasure. I love that. But I will not allow myself to justify my disobedience to the Word. Part of my sanctification process has been to fight to process my emotion through what I know from the WORD, not from what I know I FEEL. And the circumstance I've walked this week has been hard for me to stay on this side of righteous. My anger, in particular, has developed a sense of ungratefulness. Things didn't go as I expected, therefore it's easy for me to assume that the "things" must be wrong. Oh, how easy it is to slip. Can I get an Amen? But now, after days of processing, praying, confessing, confessing, confessing, where does this lead? Right into "BE STILL AND KNOW." 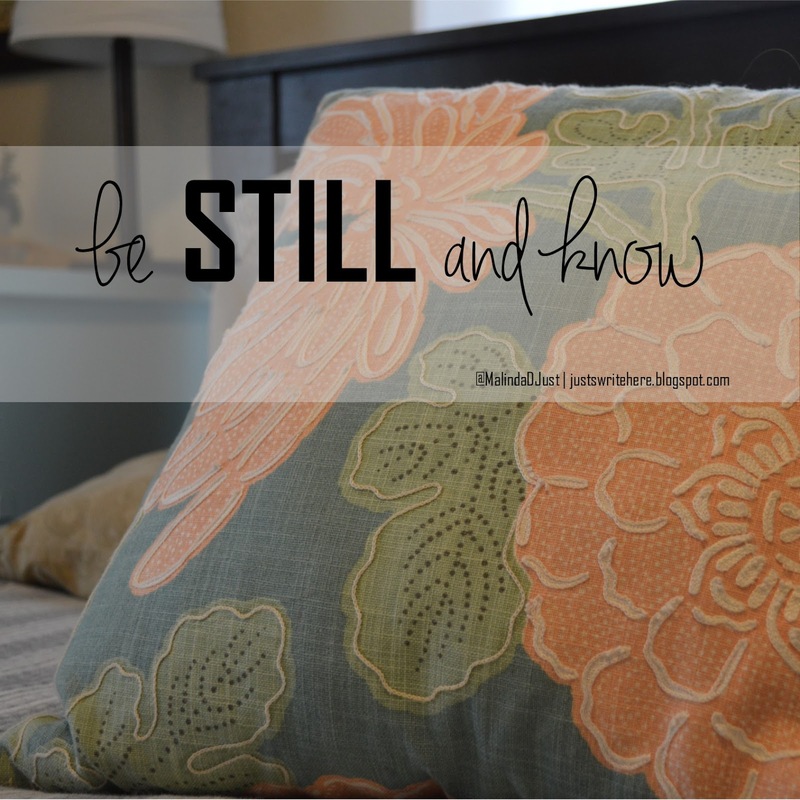 In this time of packing, negotiating, moving, selling, running from one thing to the next, I need MORE be still, not less. Maybe you do, too? If you're also in a place of unrest, battle, turmoil, confession, take time to be still and know...we'll go through this cutting/pruning process together! focusing on (the) WORD as encouragement for Foundational living.